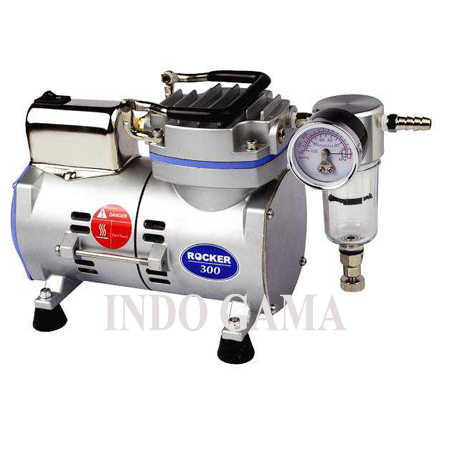 Rocker series vacuum pump is a piston-powered, oil-free pump. With innovative electronic, mechanical technology and human design concept make Rocker’s family quiet and low vibration, compact and light weight, clean and maintenance free, safe and comfortable. Directly motor driven without transmission mechanism and quality rubber feet keep noise level only 48.7~60dB, which is the lowest among equivalent products. Aluminum die-cast and precise construction make Rocker’s family so small and compact, weight only 4~6Kg. Oil-free design makes it clean and maintenance free. Rocker’s family are CE approved, it not only promise safety but also make operator feel comfortable.